Posted on June 10, 2014 by Ching under Travel. 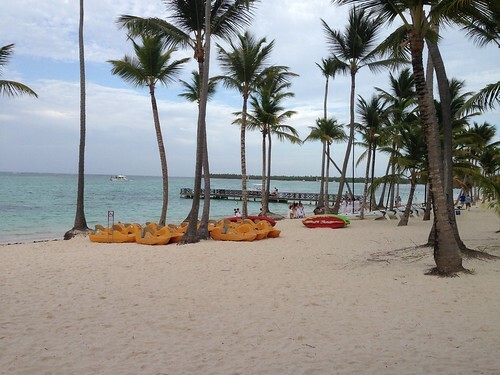 This is where are resting our heads this week. Not much privacy but you can’t beat the location. We are on the far West end of the resort, where it’s quieter and there’s not as much traffic. 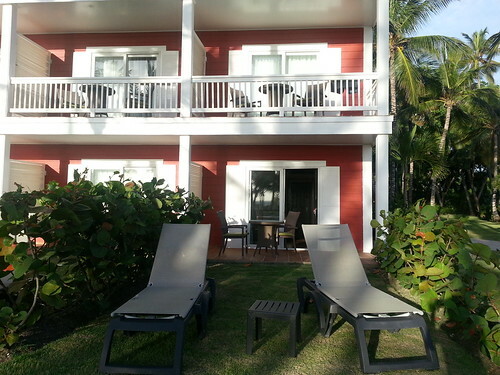 We have our very own lounge chairs and we’re just a few steps from the beach. 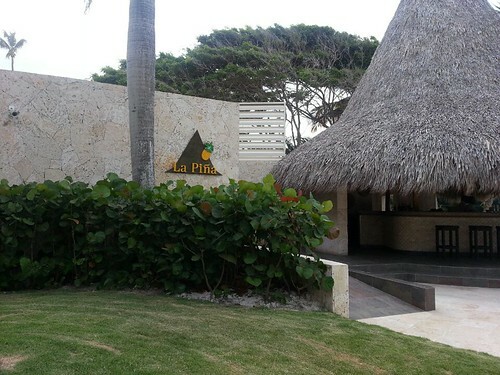 La Piña is right by our room. This is a bar but it’s not like the other bars. They only serve fresh pineapple and fresh coconut drinks and only on specific days. It closes at 5 pm so the noise factor isn’t an issue. And they actually shut down early when they’re out of stuff. 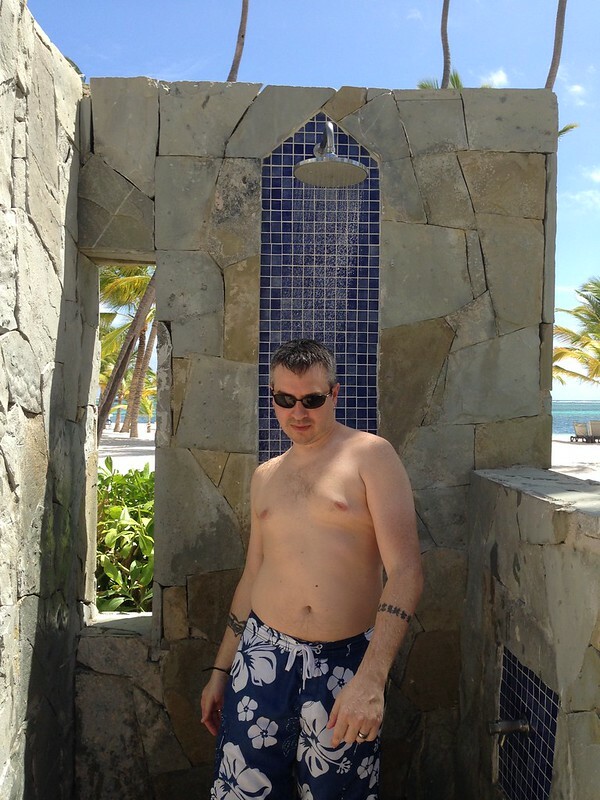 The thing to remember is that the pineapple and coconut drinks aren’t included in the all-inclusive package. The pineapple and coconut drinks are actually $1 for the non-alcoholic version or $2 with booze so, if you venture out this way looking for one of the fancy drinks, don’t forget to bring cash. 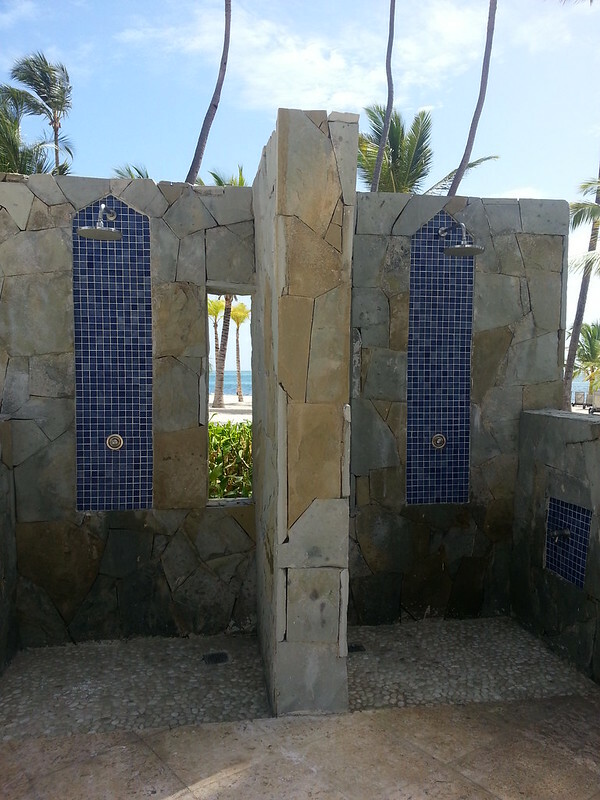 There are a couple of outdoor showers right outside our room. It’s actually come in handy several times. We’ve made good use of them. 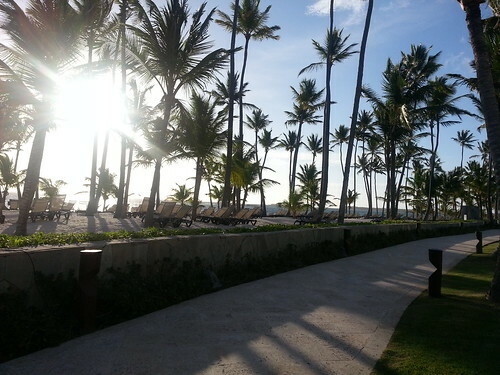 The sidewalk spans the length of both Barcelo properties: Barcelo Bavaro Palace Deluxe (the main complex and family area) and Barcelo Bavaro Beach (the adults only side). 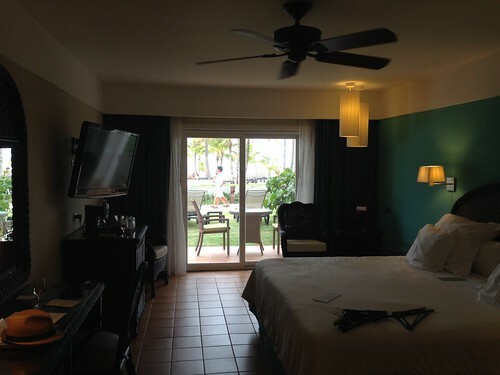 Here are a few more pictures of the resort. 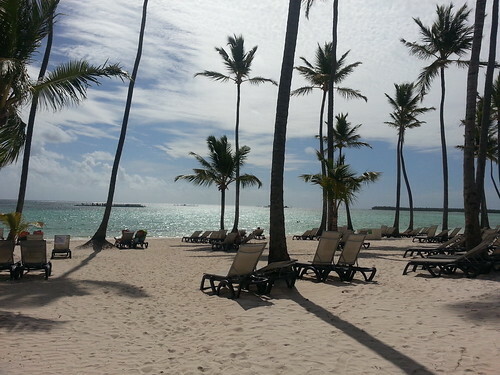 This is the beach that is directly in front of the Barcelo Bavaro Beach pool area. Orange towels represent the adults only side. 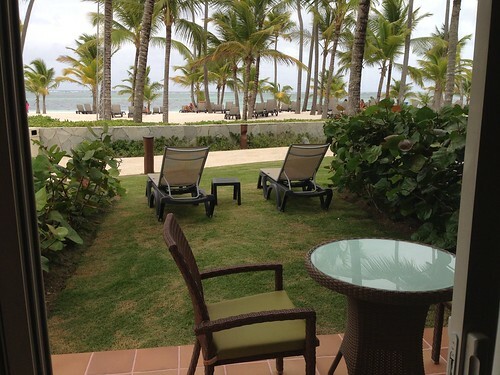 The Barcelo Bavaro Palace Deluxe guests get yellow beach towels. We’re allowed to play on their side but they’re not allowed on our side. Thank heavens for that! There are a lot of people staying here but the beach never feels crowded. The beach on our side never feels crowded anyway. 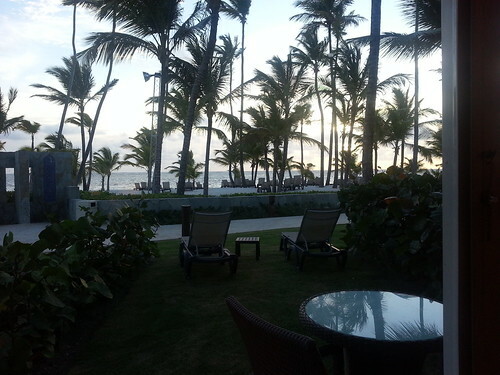 It’s a different story on Barcelo Bavaro Palace Deluxe side. There are people everywhere. You can’t escape them. You don’t have a choice but to go over there though, because that’s where you get equipment like kayaks, pedal boats, etc. for water sports. The pool was really crowded on Sunday, but nothing compared to the family side. They have a much bigger pool and it’s always crowded. At least on our side we’ve only seen it super packed one day. 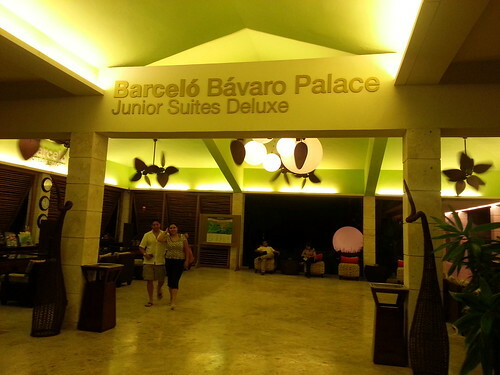 On the Barcelo Bavaro Palace Deluxe side it’s packed everyday. There are several lobby areas so be specific when meeting someone. 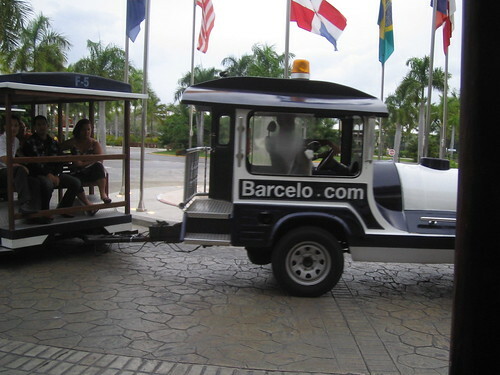 No worries if you are not so fond of taking long walks or if you get lost because there are trains that make several stops throughout the Barcelo complex. There’s one every 15 minutes (sometimes sooner, and sometimes more than one). The trains run until 4 am, we’re told. We’ve not tested it though. Anyway, it’s getting late and almost time for bed. I will write more about our vacation next time. Check back soon.